Mutual funds have contributed about two-fifths of incremental funding to non-banking financial companies (NBFCs) and housing finance companies (HFCs) in the past couple of years. The liquidity crisis after the Infrastructure Leasing and Financial Services (IL&FS) default has changed the dynamics of this funding considerably. Analysts at Nomura Research point out that mutual funds’ holding of commercial paper (CP) and non-convertible debentures (NCDs) issued by retail asset financiers has increased 14% since end-August. It indicates that this segment has not been impacted by the crisis, but has instead gained. But most other segments have been hit. In the case of wholesale asset NBFCs, funding reduced by almost 20%. “Some of these NBFCs ran short-duration loans against their share portfolio through this CP funding, which could have been wound down," analysts at Nomura wrote in their note to clients. Funding to the country’s two largest HFCs fell 13%, partly because of HDFC Ltd’s ability to raise funds from other avenues. While other HFCs saw a 38% decline in funding from mutual funds, a large part of this was because of early redemption by some companies which sold their loan portfolios to banks. Even so, Nomura’s analysts said: “HFCs have also seen a +20% drop in their NCD holdings. In our view this is negative, as NCDs contribute 40-45% of funding for HFCs." 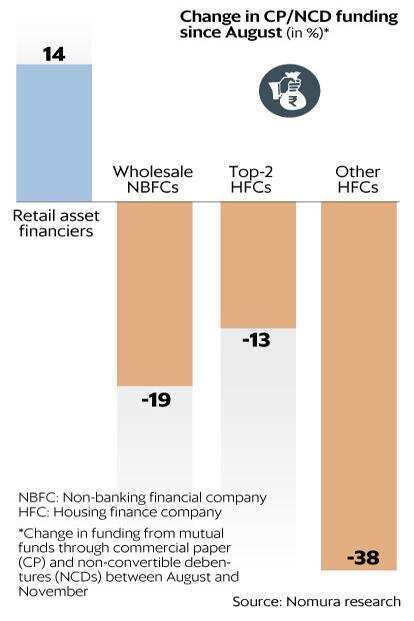 While things appear to be normalizing now, investors continue to be cautious about NBFCs and HFCs, which were hit the hardest. The divergence that occurred with the flight to safety/quality by mutual funds is more or less reflected in the share prices of companies in these different segments.